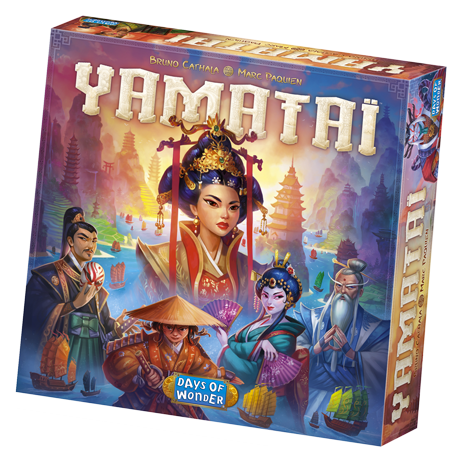 Queen Himiko has tasked every builder in the kingdom with a prestigious mission: build the capital of Yamata� and make it the jewel of the archipelago. Your task: surpass your competitors and build the most prestigious city of them all, using resources from the fleets that travel through the kingdom. Prepare your strategy, recruit specialists, and do whatever is necessary to become the best builder and be rewarded by Queen Himiko for your work. In the end, only one name will be remembered as the greatest builder of Yamata�! In Yamata�, players compete to earn prestige points using different strategies. Clear the different islands of the archipelago to recruit powerful specialists that will assist you, or use the resources carried by the boats that navigate between them to construct buildings on the islands! And, if you�re skilled enough, try creating prestigious buildings such as high temples or rare torii. However, you are not alone in competing for Queen Himiko�s favor� will you manage to surpass your opponents? 40 to 80? minutes playing time.